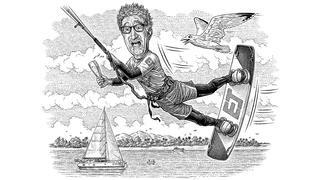 Kitesurfing is not Eddie Jordan's forte. Illustration by David Hopkins. I’m a bit old fashioned when it comes to what I take out of the toy box. I love a simple Hobie Cat. The whole Jordan clan was in Mauritius for Christmas and I sailed my Hobie every single day. I did try kitesurfing, but I was just hopeless. First off, I think you need to be younger than I am for kitesurfing, but you also need balls of steel. It’s really not for the faint-hearted. When you get lifted up into the air, you really go. The kids were giving me a bit of stick for not getting the hang of it, but I got my revenge when they were all out on their stand-up paddleboards. The water in Mauritius is so warm that if you do get plunged into the drink when your dad runs over the back of your paddleboard in his Hobie, it’s not so bad. Sadly I missed out on the New Year’s Eve celebrations with the family as I had to dash to Monaco to do some filming for Top Gear. I’m sworn to secrecy on what went on, but it’s pretty amazing. I am enjoying doing Top Gear with all the guys but one thing that’s been great to see is how much Matt LeBlanc is taking to it all. He’s actually becoming a good friend of mine and I’ve given him a taste of superyacht life – I think he’d slide into it quite easily. I’m going to say something now that might shock you: I have tempered my view ever so slightly on Jet Skis. I haven’t changed my mind totally – they’re still noisy, annoying and driven mostly by idiots – but I had to ride one recently for the show and what they made me do (or rather taught me to do) I enjoyed. I’ll say no more than that. 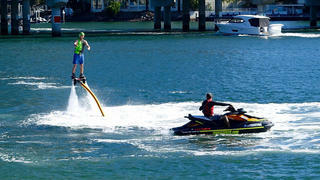 Jet boards, on the other hand, I am into and I’m still shopping around for a couple. They’re basically paddleboards with an engine and look like a lot of fun. Much better than actual, regular paddleboards, which I find really boring. Honestly, what would I want to do that for? And have you seen the guys who use them? Cruising along flexing their pecs for the girls? It’s more of a catwalk than a water toy. Much better to stick an engine in it and actually have some fun. Formula One has taken its toll on my hearing, so I’m now restricted in the toys I can use. Seabobs, for instance, are off the agenda, as are submarines. It’s one of the reasons I love sailing – you don’t have to listen to anything, it’s just the sea and the sky. None of the older F1 guys can hear very well – they all refused to use earplugs in the early days. Musicians are the same. About five years ago I was in Cape Town having my hearing checked and I turned to look at the man beside me to find it was Roger Taylor from Queen. Like every musician I know, he is as deaf as a post. I’m sailing in a regatta in South Africa in a few days, and racing there is always pretty wild. There’s nothing between there and the Antarctic, so it’s real four-seasons-in-one-day stuff. It’s my last hoorah of the holiday season as it’s back to Monaco soon for more Top Gear filming and more Formula One.